Technology company DADI decided to dispense with offices for good. Founding partner Chris Mair explains why he rejected bricks and mortar and how the company runs on an entirely distributed basis. Flexible Boss editor Heather Greig-Smith asks Chris what lessons other organisations can learn from this approach, looking at the infrastructure, culture and effort needed to make remote working a business success. 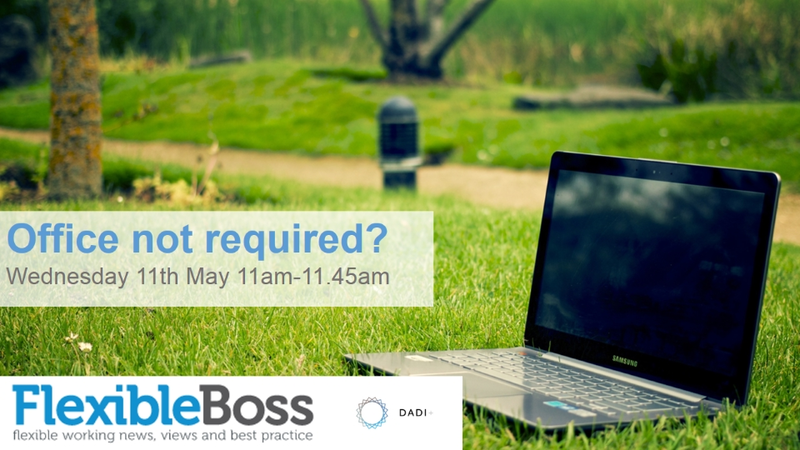 This session will help organisations keen to embed flexibility and increase employee autonomy and engagement. Tips to help managers, departments and teams challenge the status quo - even if they want to keep their offices as well. A webinar for HR and Diversity Professionals. 80% of people actively look for flexible working options in prospective employers. So why do so few employers enable and support flexible working despite the fact that the ‘right to request’ flexible working for all employees has been in place for over 2 years? We’ll be sharing our latest research findings to shed light on the needs, wants and challenges from both sides of the employee/employer fence. Jennifer Liston-Smith, Director, Head of Coaching & Consultancy, will be joined by Sarah Boddey Senior Vice President, Chief Diversity and Inclusion Officer at Northern Trust, and finance sector recruitment specialists, Jon Wilson and Mark Lawson of Hydrogen to share their experiences and the challenges and benefits of embracing flexible working in the banking and finance sector. Leading employers from the technology sector will be joining us to share their experience and the challenges and benefits of embracing flexible working. Leading employers from the legal sector will be joining us to share their experience and the challenges and benefits of embracing flexible working. My Family Care will be joined by Becky Morgan, Associate Director of Legal Practice at Hydrogen Group and D&I heads from Leading law firm, Baker McKenzie. It’s the HR issue that’s here to stay. The Office for National Statistics predicts that by 2017, 30% of the UK workforce will be over 50. This percentage is only going to increase. The implications are obviously far reaching and employers now more than ever need to consider the potential impact and how they’ll address the issues and opportunities for their older workers and wider workforce. Employer(s) leading the field share their experience, challenges and successes on the key issues for the over 50’s including caring for older loved ones, flexibility, health and wellbeing, and multigenerational working. Essentially, employer awards are a great way of building employer brand both internally and externally. They provide a 'short form' way of getting a company's message and culture out both internally, and to potential external talent. And in a marketplace where more of the talent than ever before has work and family commitments, some employers are leading the field! We’re joined by two organisations running key award schemes, Working Families and workingmums.co.uk, to discuss the trends in making work+family work and what they look for when it comes to award entries. We’ll also be hearing from multi award winning employers who’ll be sharing their stories. My Family Care and An Inspirational Journey talk to leading engineering and technology companies to explore and understand their successful approaches. Only about 8%* of engineers in the UK are women and both the lack of female graduates and the loss of skilled women from engineering remain pressing concerns in this profession which continues to experience a strong gender imbalance. Other science and technology sectors face similar challenges. Jennifer Liston-Smith, My Family Care Director of Coaching & Consultancy and Heather Jackson, CEO and founder of An Inspirational Journey, are joined by Sue Cooper, HRD UK & Europe of Atkins and Joanna Hodgson, Industries & Business Development Technical Leader, Europe & UK of IBM. They’ll be having an in-depth discussion about the issues, challenges and solutions to retaining women. Many companies now embrace the need and business case for supporting working parents and carers with policies and practices from flexible working to practical help with care. But research and experience show a critical success factor is the capability of managers. A ‘good’ line manager can be decisive in how employees combine work and family and keep career on track. But the lot of the line manager is not an easy one. Managers face conflicts and challenges in delivering demanding business targets, managing diverse teams and implementing family friendly policies. With the right to request flexible working opening to all employees from 30th June and Shared Parental Leave in effect for babies due in April 2015, they have even more on their plates than ever before. Enabling managers to manage these people issues well is often overlooked in organisations. In the research and surveys that My Family Care has carried out over recent years, many employees cite that interpretation and application of policy vary widely (and unfairly) across organisations depending on individual managers’ personal circumstances and values, disposition, management style and understanding of the level of freedom they have to interpret policy. From next September everything changes when existing childcare voucher schemes will be closed to new entrants and the government introduces a new tax-free scheme. With HR benefit experts, we’ll look at how and why the system is changing, together with both the practical and cost implications for employers and what they could or should be doing between now and September. On a broader front, we’ll examine where employers are at when it comes to being ‘family-friendly’. To what extent do UK employers support working parents with childcare related benefits and support? And how do they measure the impact and the ROI of these initiatives? We’ll be sharing the results of our latest employer survey. It’s an opportunity to understand how other employers are thinking about the issue, get a perspective on the different opportunities presented by this change, and the ways the ‘childcare challenge’ is being addressed in UK businesses today. HR in further Education and Universities has its own unique opportunities and challenges, yet the task remains the same the same; how to support ALL of your staff to enable them to produce their best work. We've brought together a panel of HR professionals from leading universities that recognise and are addressing the diverse needs of parents and carers in their organisations. Find out what they see as the critical drivers, the tools and approaches they employ, the benefits and the return on investment; from retaining and attracting female talent to wider support and working practices for others with diverse needs when it comes to combining work and family. Unquestionably, talent retention is not just about mums any more. With Shared Parental Leave in place parents have greater flexibility than ever about how they ‘mix and match’ care of their children. We’ll be sharing our latest research on what dads really want and need, and talking to our employer panellists, companies that are leading the field in understanding and supporting the needs of their working fathers. • What do fathers actually want and need from their employers? • How do businesses benefit from engaging and supporting new and expectant dads? • What happens if we ignore dads and focus only on mums? • How do we take this forward: what does best practice look like? strategies and implement employee solutions. Our thought leading webinars explore the work+family issues of the day sharing best practice and employer experiences.